I am already on record as being a huge fan of the Muppets, going back to the early days of The Muppet Show. And I wasn’t shy about professing my love for the recent Muppets reboot (2011) starring Jason Segel and Amy Adams, because it resurrected so much of the pure whimsy, joyful exuberance and gently caring spirit of the first and best Muppet film, 1979’s The Muppet Movie. So how does the new film, Muppets Most Wanted, fare in comparison? Well, let’s just say that it’s a frog of a different color. Not a completely different color. Just a few shades off. After the opening number, MMW never quite rises to the level of its predecessor. It’s not that it can’t quite hit the high notes; it’s more like it’s not clear that they’re trying. Generally speaking though, it does meet the Muppet standard for entertainment value, and that means kids and adults alike will enjoy the film, in their own ways. Grown-ups will guffaw at the moments of parody, the playful pop-culture references and the quick one-liners, while kids will have fun watching the silly and colorful antics of the characters. It may not be the Muppets at their best, but it is them in their most familiar habitat. 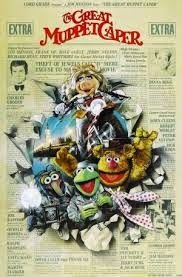 One thing I confess I don’t understand about Muppets Most Wanted is the intentional decision by the filmmakers to loosely shadow the storyline of The Great Muppet Caper (1981). In The Muppets, the theme of reviving past greatness by getting the group back together again naturally lent itself to multiple parallels to the original, which was the story of Kermit and how he gathered the group together in the first place. MMW does something similar with its call-back film. Both are predicated on the Muppets venturing overseas and getting entangled in a major heist. But why? The Muppets had something to say about reinvention and facing the future that actually builds upon the original, but that is not the case for this newest film. Both Muppets Most Wanted and The Great Muppet Caper are varieties of caper film, but there is no necessary link between them. So what’s the point? Why not set off in some new, different direction with MMW? The Great Muppet Caper wasn’t that great to begin with. Why use it as a model? And does this mean the next film is going to be The Muppets Take New Jersey? That aside, Muppets Most Wanted as a film is not interesting enough to warrant much discussion. In fact, I wouldn’t have made a point to comment on the movie at all, except for two things about it that have been festering in my mind all week. One of them is merely annoying, but the other is somewhat disturbing. Let’s address the merely annoying first. So, is Celine Dion actually a long-lost Muppet, or did she donate a ton of money to the Muppets future re-retirement fund? Those are the only two explanations I can come up with to explain her dull (black and white in a Muppet movie?!) and completely unnecessary appearance in the film. I mean, I’ve heard that she’s capable of delivering a show-stopping performance, but this one brought the movie to such a complete and screeching halt I could swear I smelt the burnt rubber coming through the screen. 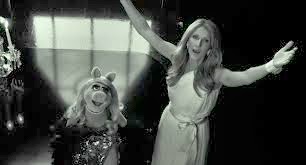 In the film, Ms. Dion serves as some kind of sparkly, magically-appearing mentor to Miss Piggy, kind of a cross between the Fairy Godmother from Cinderella and Obi-Wan Kenobi from The Empire Strikes Back. Except she sings a song and then disappears without either waving her wand or telling Piggy to go to Degobah. It certainly doesn’t advance the story or add anything of value to the movie, unless you count the slight uneasiness that comes from listening to Piggy and Celine trying to harmonize. 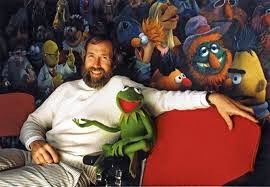 I don’t know if the filmmakers involved realize this, but since Jim Henson’s death, those of us who love the Muppets are continually asking ourselves WWJD (as in What Would Jim Do?) whenever we watch something Muppet-related. And I can’t help but think that if Mr. Henson were the one pulling the strings (forgive the pun) on this production, he would’ve avoided a scene like this. There’s something else, though, that isn’t as minor, or as easily dismissed. The film’s villain, Constantin, is an escaped criminal mastermind who happens to bear an uncanny resemblance to our favorite frog. Seeing an opportunity to do more evil, he has his agent (Ricky Gervais) coax the Muppets into going on tour in Europe, where they hope to build on their sudden, but possibly fleeting, resurgence of popularity. Once there, Kermit is quickly framed, captured, and returned to the Russian gulag Constantin hailed from. And here’s where things went a bit off the rails for me. For starters, they show Kermit being wheeled into the gulag Hannibal Lecter-style down the long hallway to his cell. That was a really disturbing image. Granted, I think it disturbed me more than it did my daughters, but that’s because my emotional investment in Kermit is much stronger than theirs. There are certain things you just don’t do to Kermit, and one of them is to treat him like a brutal serial murderer so you can reap a cheap movie parody laugh. It’s wrong, and I didn’t like it. So there. But much worse than that was the portrayal of the gulag in the film. As we follow Kermit through his ordeal, we see him confronting the other prisoners, languishing alone in his cell, and trying various manners of escape, all of them foiled in light-hearted manner by the gulag’s commander (Tina Fey). We see other prisoners treated even worse. One is locked in an isolation box in the yard (although one of the funnier surprises in the film comes when we see just who it is who has been locked away the whole time, prompting me to remark, “So that’s where he’s been…”). Others are left chained to a wall in uncomfortable-looking poses. Eventually, Kermit is able to win the hardened prisoners over, even after they realize he is Kermit the Frog and not Constantin the arch-criminal. The gulag commander, who secretly adores Kermit, even puts him in charge of the annual prisoner show. Now, if you think that ‘gulag’ is just the Russian word for prison, none of what happens there is likely to bother you much. It’s basically a Muppet version of Jailhouse Rock, a song-and-dance version of the big-house. All good, clean fun. The problem is, the gulag as it existed wasn’t any of these things. I don’t know about you, but that doesn’t sound like any plain old prison. It sounds a bit like what was going on just on the German side of the Russian border during the 1930’s and 40’s. I’m not suggesting they’re exact equivalents, but I wonder what the audience’s reaction would have been if Kermit had been sent to a concentration camp instead of the gulag. What, because it’s in Russia that somehow makes it funny? I don’t think so. At the theater where we saw the movie, one gentleman got up and left the auditorium just after the scene where Kermit is repeatedly caught trying to escape the gulag. This person exited to the parking lot, not the lobby. Perhaps it had nothing at all to do with the scene, maybe the guy just felt a sudden and overwhelming need to drive. But could you blame someone for being upset at the movie’s depiction of the gulag if, let’s say, one of their relatives or ancestors had experienced the real thing? I know I couldn’t. Even before the man left, I was already feeling pretty uncomfortable about seeing the gulag treated in such a offhanded and tone-deaf manner. The gulag system went extinct around 1960, so in Muppets Most Wanted we are most likely talking about the Russian equivalent of a prison. But the Russians didn’t refer to the gulag as the gulag, and as far I can tell, they don’t refer to their current prisons as the gulag either. So why did the movie feel it necessary to characterize it that way? It gives a distorted sense of history, doesn’t it, to call what was seen in the film a gulag? Don’t get me wrong; I’m not counting on the Muppets to teach history to my kids, or anyone else’s, but I have to say I’m disappointed that they didn’t have the sense or sensitivity to avoid this kind of mistake. Getting back to WWJD?, I don’t think I’m going out on any limbs when I say it’s the kind of mistake we’d never see Mr. Henson make. 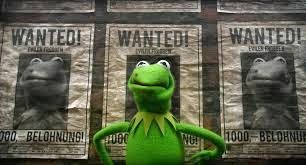 For that reason, Muppets Most Wanted deserves to have a penalty called on it. This is a bit late to the party but just wanted to say I googled immediately after finishing to see if anyone else felt extremely uncomfortable about the "ha ha wacky gulag humor!" ongoing theme. I didn't like the movie overall, but that was the thing that stuck like a sore thumb among other stuff that was just "meh". As I said in my own review, you might as well throw Fey and Kermit into a concentration camp and have them do an upbeat trio number with Anne Frank. It was SO confusing, wondering why this, of all things, is what they chose to go with out of the countless ways they COULD have gotten Kermit out of the way for most of the movie. Sorry it took so long to post your comment. I'm right there with you. 'Upbeat trio number with Anne Frank,' exactly (loved that, by the way). Somewhere in Hollywood, there's a writer smacking his or her respective head and saying, "Geez, why didn't I think of that?" Tone-deaf, thoughtless, and sloppy. Three things that did not typify Jim Henson's work, in my humble opinion. Anyway, nice to know there's someone else out there who shares my sentiments on the matter. Thanks for chiming in.